House Extension Cost 2019 - What Is The Cost Of An Extension? House Extension Cost 2019 – What Is The Cost Of An Extension? If you like having more rooms in your house and don’t want to change location, why not extend your house and stay in your favourite suburb. Recent figures from the Royal Institute of Chartered Surveyors(RICS) show that while the housing stock is growing there are actually fewer houses being bought and sold. People therefore are staying in their homes longer and, according to the RICS, they are moving on average every fourteen-and-a-half years. As it becomes apparent, more and more homeowners are extending their homes in the UK. The reason is that it is often more economic to extend your property, rather than buy a new one. By building an extension you get to save on fees, removal costs and avoid having to change neighborhood, while your children remain at the same school. House extensions may seem expensive in the beginning but after effective cost analysis you will get rough idea of the actual amount that you will need to budget for so you can have that extra room you need for your growing family. Budget :Your budget for the extension should include all the materials, construction fees and house plans that will be required for renovating your home. Before you even start working on an idea, you need to know about the building regulations so as to comply with it in regards to the location of sewers and other infrastructure. Seek advice : Ask a professional builder to offer you house extension ideas that you may not have thought of or even considered as a possible option. If you are trying to cut on cost of an extension then you should also enquire about the rules and regulations of flat pack extensions, glass extensions and timber extensions to ensure that these extensions are legal in your area. Why build a house extension? What sort of extension do you want? Shall I hire RIBA architects or an architectural technologist? What is the average cost of an extension? Can site constraints increase home extension cost? Why hire a professional house extension company? Building a house extension is an ideal way to add as much space as you need to your property without the cost and hassle of moving. A home extension can add considerable value to your property while also providing you with the extra living space you need. With some careful planning you can easily design the perfect extension for your home. The cost of a house extension might exceed your budget if you do not plan carefully. This is why it is very important to have at least a rough idea of how much your home extension will cost. Adding an extension to your home is a big and costly project, so the only way to get this extra space you always dreamed off, is if you consider carefully your planning and designing needs. The house extension includes not only the materials but also planning and building fees. Before you even start thinking of designs and looking for professional builders, you need to know about the building regulations and how they will affect your project (sewers and other infrastructure). When it comes to house extension ideas, finding a professional builder can really help, as they can give you ideas that you might not have even thought of before. The biggest advantage of not moving and opting for an extension is that you will not be asked to pay stamp duty. You also get to save on fees and not have to go through the stress of moving to another neighborhood. Realizing that a home extension is far more beneficial takes a smart person. What works is to extend your property so you can make a gain on the investment which means you have to consider any home extension work you intend to carry out. This part of the planning is understandably important. How much space do you want to add to the house? You could add a conservatory, one or more bedrooms, a study or dining room, a play room or even a simple-storage room if you are in need of some space for items that wouldn’t be suited for storage in a garage, loft or shed. You also have to consider some practical issues which do not concern a house extension process directly. An excellent example of one of these practical issues is access. If you add it to your accommodation, it would mean that you have more cars and you have to answer the question of whether you will need to park the cars on the drive. If you do not have a drive, then the absence of off-street parking facilities could be why your planning permission may be refused. The same thing applies to if your house is on a terrace, do you have access to the back of the building where you can unload building materials. If you do not have, what is your plan? Do you intend to bring every bit of material through your house? Other important aspects to consider before you get to the stage of getting your house extension plans drawn are matters like soil conditions on the site, services, surrounding trees, any history of flooding and rights of way. Even then it might be wise to pop into your local planning office to find out informally what might be permitted especially if you are planning anything out of the ordinary. It is always wise to research the local planning policies so that you will be aware from the start that an uphill struggle awaits you if you plan anything too exotic in the area where your house is situated. In some instances it might be wise to ask your adviser to write to the local planners after any meeting you might have had with them confirming what was agreed. Providing it is written tactfully this should help pave the way and in a sense nail them to the mast, particularly if they show any signs of backtracking at a later stage of the process. Another wise move is to get to know someone who has done a similar extension. They might have a builder or particular tradesman to recommend (or not recommend) but either way they will be full of useful tips on how long to allow for different tasks and many other matters. Other important issues concern the person you will choose to design your extension, how much it will cost, and how much of the design (and the labouring) can you do yourself? Just as crucial is the style and feel of the extension you require. Are you really sure in your own mind that you know what this is? All of these issues plus many others are tackled below. An alternative to the usual warranties available for building work which can also be applied to extensions, loft conversions etc, is the MasterBond warranty from the Federation of Master Builders (FMB), which has similar characteristics to the NHBC and Zurich registered builder schemes. MasterBond will cover works carried out by MasterBond Warranted Builders (note that not all FMB members are registered as Warranted Builders) against defects due to faulty workmanship or materials for two years from completion, (except for electro-mechanical items which are covered for one year only) and against structural defects for a further eight years. FMB require the building work to be notified to building control, who will inspect the work at stages dependent on the type of project. The benefit of Master Bond passes automatically to new owners and the cost is 1.5% of the contract value, including VAT. MasterBond is subject to exclusion clauses and limitations, satisfactory for extensions, loft conversions and similar projects, but the financial limits of the policy may not be acceptable to lenders on new homes. Structural warranties for extensions are also available from project-builder-insurance.com. Many people avoid using architects for smaller projects because of the RIBA scale of fees, which starts at around ten per cent. However on projects of less than £25,000 most architects prefer to charge by time, so if you choose an architect it is probably preferable to negotiate a fixed price if your extension is relatively small-scale and not a complete remodelling of your house. Many extensions or alterations to period or listed properties may benefit from the expertise of an architect. However if your extension is small scale and does not involve a great deal of design input many RIBA architects would probably say you would be better off with an architectural technologist. A technologist may have studied as an architect but not completed all the examinations. Like builders, house designers do not have to be registered. 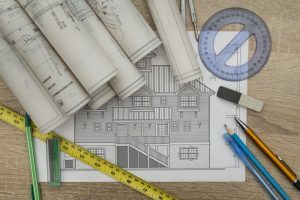 When seeking a house designer you may find some you talk to have an engineering background and have worked as draughtsmen for local authorities or engineering concerns. Others may be members of the Royal Institution of Chartered Surveyors (RICS) or the Chartered Institute of Architectural Technologists (CIAT) or the Association of Building Engineers (ABE) formerly the incorporated Association of Architects and Surveyors. They could alternatively have a practical background and be a member of the Chartered Institute of Building (IOB) or the Institution of Structural Engineers (ISE). Most of these bodies require full members to have relevant academic and technical qualifications. Whichever designer you choose, ensure that they carry sufficient professional indemnity insurance. Unless your house is in an exceedingly poor state or is listed Grade I or Grade II*, or you are disabled, you are likely to have great difficulty in obtaining a grant for your work. The philosophy behind house renovation grants was to assist people on low incomes to bring what were known as unfit properties up to modern standards. Generally the grant awarded was 50% of the cost of the work up to a maximum of £20,000. However over the past 18 months these have been phased out over most of the country and generally the only local authority grants available are historic building grants. In the case of Grade I and Grade II* properties these are awarded by English Heritage. You are also unlikely to succeed if the house is less than 10 years old or you just want to increase your living space for example with a kitchen or lounge extension. If your house is a period property, whether it is listed or not, some local authorities will give historic building grants. But even then there are many conditions. The first of these is that they are generally given for improvements to the historic fabric and not extensions, so unless your extension is needed to bring the property up to fitness standard i.e. it lacks the basic amenities of an indoor bathroom or toilet, you are unlikely to be successful. When historic building grants are awarded again they are entirely discretionary most local authorities will only award up to a maximum of around 25% of the cost of the work. The only good news is that VAT registered contractors can zero rate invoices for material alterations that need listed building consent. The average cost of a 5 x 5 extension can cost anywhere between £30,000 to £50,000 depending on your location and your requirements. If we also include the VAT, the cost could go anywhere from £40,000 to £66,000 outside of London and the south east the £30,000 – £50,000. The average cost for a house extension comes to £1,500 – £2,000 per m2 in London and £1,200 – £1,500 per m2 in the south east. To this cost you should add a 10-15% for professional fees + VAT. A two-storey extension, usually costs 45% more. 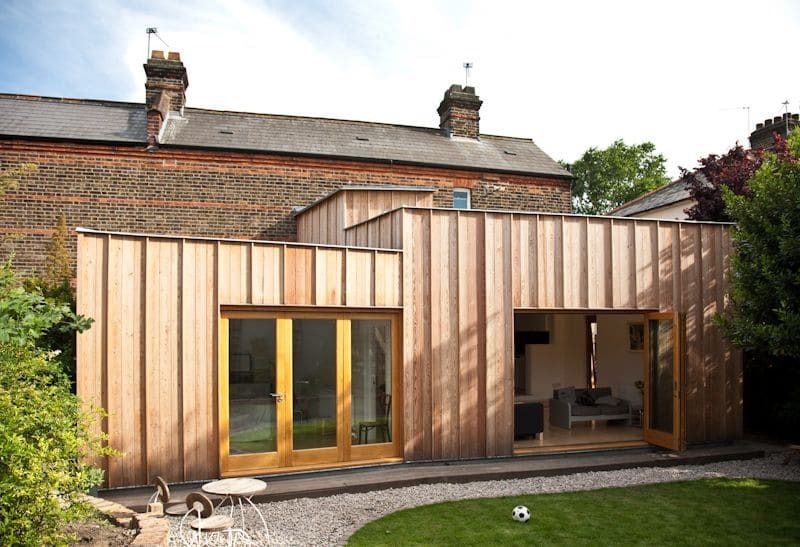 Timber and Pre-fab house extensions are some of the most cost effective solutions for extending homes but they will not improve your property value. Brick extensions are quite expensive but are more durable and will increase your property value significantly. Glass room extensions are becoming increasingly popular because glass rooms and extensions bring in a lot of natural sunlight into your home, it is still a safe and secure solution and looks fantastic. Glass room extensions are also great for improving your property value if your home has a modern style. Any fixtures, fittings and equipment required. It is very difficult for a home-builder to estimate the house refurbishment and renovation costs on a square meter basis because each area of the house might requires different attention. There is need for the builder to gain access to the extension by removing an existing external wall. This might involve steel support beams, flooring and general disturbance to the house while this is done. Many builders execute this job as late as possible so there is the least amount of disturbance. This includes hiring for rubbish removal, a project manager, architect fee, insurance and any building control and search fees. Also, if you are modifying your mortgage or getting a new one for the extension there are also bank fees to take into consideration. These costs include all the decorating items, such as light fittings, switches and paint, wallpaper and floor coverings to match the rest of your home. Your interior design can also include flat pack or glass extensions within your home to divide rooms, build in walk in closets or to hide unsightly bits of your home. A lot of glass extensions are installed in home simply for interior decorative reasons. The cost of a single storey extension is anywhere between £1,500 to £2,000 per square meter if you live outside of london and in the south east and from £1,200 to £1,500 per m2 anywhere else in the UK. A generally-accepted rule to calculate the cost of a two storey extension, is to add 50% extra when both storeys have the same size. Again, it is very likely that the prices in London and the South East are higher. For more accurate figures you should try and get in touch with professional house extension companies immediately. They will be able to review your ideas and provide an up-to-date evaluation of your property in a way that will help you streamline your plans and keep the price of your house extension as low as possible! If you are interesting in getting more accurate figures about how much will your home extension cost, you should use an extension cost. The cost of adding a bathroom starts at minimum at £5,000, depending on the quality of materials, sanitary ware and finishes. If you are planning to add a kitchen to your new home extension, estimate to spend from 10,000 to £15,000 depending on your specifications, kitchen range (low, mid, high) with appliances. The costs above assume that the extension will be built with all the usual finishes and fittings including electrics and lighting. This includes things like basic painted walls and carpets or engineered oak flooring. If you want finishes and fittings at the higher end of the market this will obviously increase the cost, eg, fitted joining, tile flooring and so on. When considering what type of glazing you will need bear in mind that your choices here will also increase extension costs. Popular door choices for extensions include sliding or folding doors – to find out more, get the latests reviews, costs and all the essential information on the best sliding door companies you can read our article here. Ground and soil conditions – certain types of soil and ground conditions need special construction techniques which can prove costly. Site access – problems with limited access to the site, the ability to bring in the needed machinery, tools and other equipment. Logistical problems can cause delays and other issues that increase the cost of build. Structural issues – does the extension require the removal of supporting walls? Any removal of a structural wall will need steelwork and this will raise the cost. Services – if there is an impact on pipework, drainage or utility meters, for example, if these need to be moved or installed, costs will increase as a result. Costs are higher in the South East than they are in the rest of the country and if you live in London you should expect to pay considerably more. The quality and type of materials used will directly impact the cost of construction as will the type of construction you are looking for. Use an architect: It is always worth getting advice from an architect. These highly trained professionals specialise in helping people get exactly what they want from their extension whilst keeping the costs under control. A good architect will work closely with you, helping you maximise your budget and advising you where to cut back on spending and where to increase it when necessary. Get plenty of quotes: Your architect can help with this too by giving you a list of reputable house extension companies. In order to maximise choice and get a good idea of the actual costs before you start to build it is ideal to get 3-5 quotes for your home extension project. Note: We recommend to use services such as Ratedpeople, Mybuilder and Trustatrader apart from our nationwide network of tradesmen. Get a contract: In order to prevent any nasty additional costs as the project progresses ask your architect to help you to draw up a building contract. It is also useful if they inspect the work during the project to ensure that it is up to standard, is following your design and specification requirements, and meets any building regulations. You can never be wrong about asking for an accurate quotation from a designer before proceeding with a design project or even hiring a designer. This will help you get a better understanding of the costs and expenses needed to prepare the designs. Consult with the designer for what the fees entail, who will bear the cost of fees paid to the local authorities and if the project already has provisions in case it will require structural calculations. For new build-in domestic properties such as self-builds, there is zero rating for value-added tax, but this does not extend to extensions. But if you own a listed house, any material alterations you carry out on your house, as long as it requires listed building consent, bears zero-rated VAT. You only have to make sure the work does not involve maintenance and repair. If you are doing renovative work or extending your property that has been empty for ten years or more and can prove it, it will be free of VAT because the property will be treated as a conversion. If you have left the property empty for three years or more, the VAT on any renovation work you carry out will be reduced and levied at 5%. Unless it is a short contract, stage payments will be on a monthly basis. Try not to make any payments upfront. If it is necessary to purchase an expensive item perhaps a bathroom suite some months in advance of its installation, you should make sure it is in your name and not that of the builder, just in case he should go out of business. If necessary you should go to the place where it is stored and make sure the ownership is transferred to yourself. Pre-fabricated or flat pack extensions in UK will be between 10 and 25% lesser in price than an extension built on site. This type of extension is made primarily in a factory where the walls are built and then setup on site. This is a popular choice for owner builders as there is a lot less work involved and for home owners who are looking for a temporary and more cost effective solution for their homes. Prefab extensions can be insulated for noise and temperature controlling so your private conversations will remain private and your home will require far less energy to keep temperatures stable. 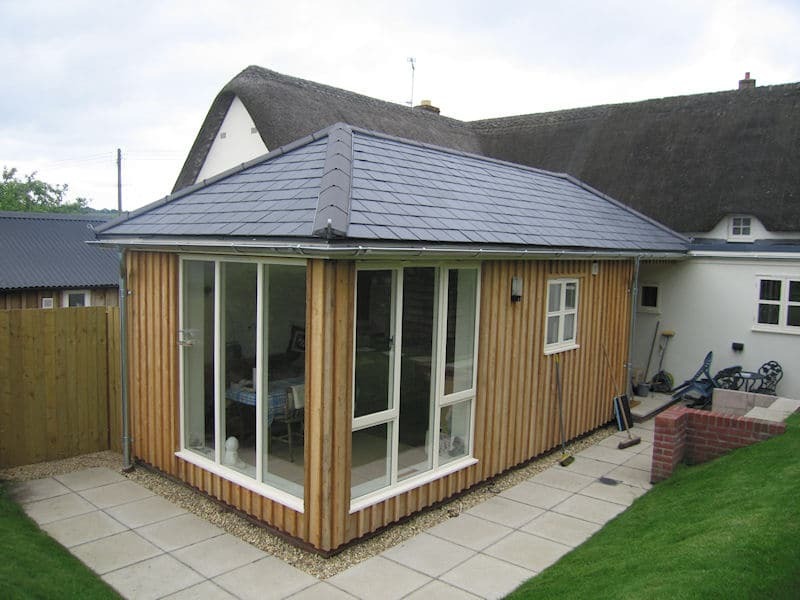 Prefabricated extensions can be given a natural look and can be incorporated into any section of your home without anyone ever realising that your home have been altered. Our world has an abundance sunshine that can not only lights your homes but also help fight back the darkness in your heart and mind. Glass extensions are perfect for bringing natural sunlight back into your home and allow you to cultivate orchids and other plants indoors that you would otherwise be unable to grow. The glass is of special quality and is often double glazed for additional insulation. The roof can also be made of glass for more reflection of light. 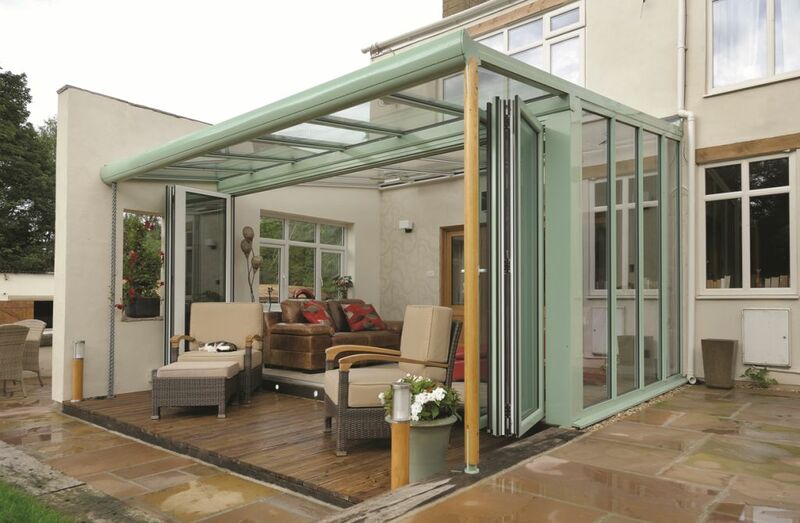 A typical glass extension costs between £20,000 – £80,000. For a cheaper solution you can go for a modern conservatory and expect to pay between £4,000 – £20,000. Frameless glass structures look very beautiful but if you use panels that are longer than 240 cm, the cost nearly doubles. A single reinforced glass panel costs from £1,000. 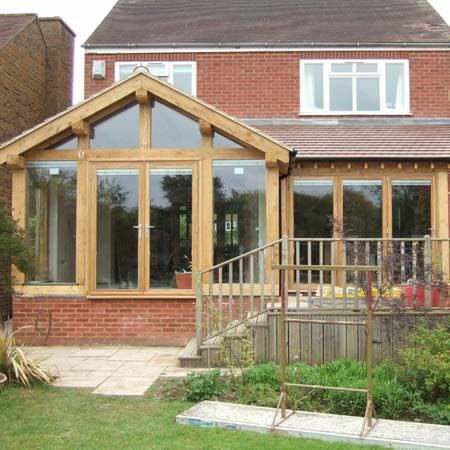 Timber frame extensions are built on site from sustainable timber and are an eco-choice for the house owner. They are well insulated and can be built to match the existing structure and made to look like part of the original house and not an extension so your home will look natural even though there are artificial walls. The approximate timber frame extension cost is around £1,200 per square meter based on Evis Build for a 60 square meter rear extension. For a double story extension, you should consider about 160% of the price for a single story extension of the same floor area. For example a single story 25 square meter extension may cost £33,000, a two story timber extension will be around £53,000. There are several house extension ideas to select from that will suit your budget. Those looking to extend their house may opt for flat pack extensions; these are easy, prefab extensions that homeowners can add to their property with minimal disruption. While there are, of course, certain parameters users most follow, as they often prove to be the most resourceful option available. Flatpack extensions are noted for being significantly cheaper than traditional extensions, or other alternatives used to add space to a house. However, they offer many other benefits too. They can, for example, be largely assembled offsite and then transferred to the intended property. This reduces the amount of work being carried out in a home, which in turn minimises the inconvenience and disruption suffered by families. Flatpack house extensions now also offer the height of modern convenience. Many extensions are prefabricated to include insulation, for both sound and temperature, as well as other features that reduce costs and building time. Some flatpack extensions are even created with the ease of the user in mind, and can therefore be delivered in such a way that homeowners themselves can carry out a large portion of the work, without much professional intervention. In real terms, this means that the cost of a traditional house extension that will come to around £35,000 could be reduced to £28,000, if the homeowner opts for a flatpack extension instead. The money saved could then be put towards interior decorating; plumbing and other tasks that require the help of a professional. This can create substantial savings in the long-term, and provide customers with the opportunity to expand their extension further, or alternatively invest the money in other home improvement related tasks. Conservatories must not face onto a highway or be higher than four metres or the original roof. The extension must be built of the same or similar building materials as the original property, so that the extension looks suitable. A single storey rear extension must be no higher than four metres and must not extend past the back wall by more than three metres for an attached home or four metres for a detached home. The best way to be savvy to the building regulations is to ask your architect for their professional advice. Make sure to apply for planning permission before beginning work, otherwise if your application is rejected you will have wasted time and money. Planning permission for extensions – extensions are permitted but there are many rules to adhere to. In general, materials should be similar to those of the original house and you can’t build any verandas, balconies or raised platforms. The extension, including the eaves and ridge height, should not be higher than the highest part of the roof or forward of the principal elevation or side elevation fronting a highway. If the extension is within two metres of a boundary, the eaves should not be higher than three metres. A single storey rear extension – must not be higher than four metres or extend beyond the back wall by more than three metres for an attached house and four metres for a detached home. A more than one storey extension – should be no closer than one metre to the rear boundary of the property and the roof pitch should match the existing building. The maximum depth of a rear extension of this kind should be no more than three metres beyond the rear wall. Side extensions – must be single storey with a maximum height of four metres and a width of no more than half that of the original house. Any upper floor side facing windows should be obscure glazed and openings 1.7 metres above the floor. Planning permission for outbuildings – this category includes sheds, greenhouses, garages and buildings or enclosures for pools, saunas, ponds or kennels. Outbuildings do not require planning permission provided that they are no more than four metres tall with a dual pitched roof or three metres for any other roof. They should be single storey, have no verandas or balconies and not be built on land forward of a wall forming the principle elevation. Planning permission for conservatories – are also permitted as long as they don’t face onto a highway, are not higher than the original roof or more than four metres in height. They must not extend more than three metres beyond the rear wall in an attached house and four metres in detached homes. Conservatories built onto the side of homes must be single storey with no verandas or balconies. Planning permission for a porch – as long as the porch is built on a ground floor area not exceeding three metres squared, is no more than three metres high and not built within two metres of any boundary, it will be permitted. Planning permission for a loft conversion – planning is permitted as long as your loft conversion adds no more than 40 metre squared of space for a terraced home or 50 metre squared for detached home. The conversion should not reach higher than the original roof, should use similar materials and include no verandas, balconies or raised platforms. Any side facing windows should also be obscure-glazed and openings should be 1.7 metres above the floor. There are a lot of cheap house extension companies whose products may seem fantastic at first but they lack the quality and will soon start to deteriorate. Prefab extensions should be of the best quality materials and glass extensions should be done correctly to ensure your extensions do not end up cracking or bursting. A home extension professional will also be able to inform you of the durability of the product so you will know whether your prefab extension is suitable for exterior walls and your glass extensions are smash proof so your family will be safe and secure.